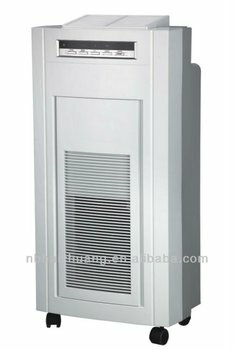 Sensor of air cleaning monitor will change the speed automatically according to the air quality. Multiple filtration:pre-filter,activated carbon filter and HEPA. Nanometer photocatalysis continually decompose the deleterious gas. UV light for sterilizing and disinfecting. Operate by remote-control and key-control,easy to use. Mobile in use and time setting.